For a delicious kosher pecan pie, check out item# 61305. 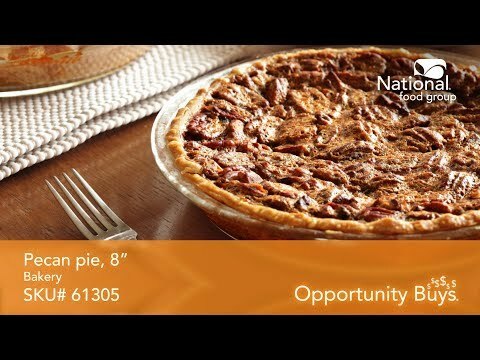 It’s an Opportunity Buy, 8-inch pecan pie that ships as six, 24-ounce pies per case. Ordering a pallet will get you 70 cases for 420 kosher pecan pies total. This 8-inch pecan pie is the perfect dessert following any meal. It features a sweet filling topped wall-to-wall with delicious pecan halves. This fully baked pie is easy to thaw and serve with no baking necessary – so you save on labor and waste. Corn syrup, enriched bleached flour (wheat flour, malted barley flour, niacin, iron, thiamin mononitrate, riboflavin, folic acid), eggs, pecans, sugar, vegetable oil (palm and soybean oils), margarine [vegetable oil (palm and soybean oils), water, salt, mono-and diglycerides, annatto (color), calcium disodium EDTA (preservative), artificial flavor, vitamin A palmitate]. Contains 2% or less of each of the following: brown sugar, salt, high fructose corn syrup, natural and artificial flavors, maltodextrin, molasses, caramel color, carrageenan, skim milk, baking powder (sodium acid pyrophosphate, baking soda, corn starch, monocalcium phosphate), modified corn starch, mono- and diglycerides, polysorbate 60, sodium stearoyl lactylate, soy flour. Wheat, Eggs, Pecans, Milk and Soy. 6-8" 24oz pies per case.